The Husqvarna Group is a global manufacturer of power products such as chainsaws, lawn mowers and other motor-driven yard tools. With manufacturing plants and sales centers in more than 100 countries, the Husqvarna brand has earned a reputation for performance and quality. If you are in the market for a riding lawn mower–or lawn tractor–the Husqvarna line of tractors is a good baseline for comparison shopping. Husqvarna riding lawn mowers are compact for better handling and ease of storage. They offer easy-to-reach cutting height adjustment at fender level, a seat that adapts to different body styles, and an ergonomic steering wheel for comfort. All models have hydrostatic transmissions, air induction mowing systems to ensure a even and clean cut, plus each machine accepts a range of towable add-ons plus a mulcher that eliminates clipping clean-up. • YTH2042: This entry-level Husqvarna riding lawn mower has a 42-inch cutting deck, a step-through driver’s seat design, a manual blade engagement control, a Briggs & Stratton Intek single cylinder motor, and an angled steering wheel. Cruise control, deck wash port for easy clean-up, and a cast-iron front axle all add the the convenience and durability of this lawn tractor designed for year-round usage. This little beauty carries a $1,499.95 price tag. • YTH21K46: This edition has a 46-inch cutting deck, a Kohler 21hp, single-cylinder engine, a pedal-operated hydrostatic transmission, and anti-scalp wheels. MSRP for this tractor is $1599.95. • YTH22V42: Step it up with more power–a 2-cylinder Briggs & Stratton engine equipped with a mechanical compression release to facilitate trouble-free starts. Other features on this 42″ cutting deck machine combine the best of the previous two models, with cruise control, step-through seating, and a pedal-activated hydrostatic gear shift. The 22V42 is priced on a par with the model above, as is the YTH22V46 that differs solely in the larger swath it will cut through your lawn. • YTH23V48: Husqvarna ups the ante in its lawn tractor line with a 23hp engine and a 48-inch cutting deck for better power on bigger terrain. The MSRP for the 23V48 is $1,799.95. • YTH24V54: This tractor will mow 54 inches of turf per turn, and the bigger 24hp Briggs & Stratton motor will chew through higher, thicker vegetation without a hiccup. The electric blade engagement control is at your fingertips. With a longer-lived two-cylinder engine, the 24V54 will keep your yard finely manicured for years to come. You’ll pay $1,999.95 for the privilege. • LGT25K54 from Husqvarna represents a bigger leap forward. Its efficient, pressure-lubed Kohler engine has both a residential side discharge and a mulch option, and when you accessorize, this 25hp hydrostatic machine becomes a formidable snow blower, thatcher, and driveway sweeper. The manufacturer suggests a tag of $2,299.95 for this powerhouse. The riding lawn mowers included in Husqvarna’s LS series are engineered for premium durability, extra comfort, and more precise performance. LS Tractors are equipped with fabricated cutting decks and heavy-duty chassis. These upscale, workhorse models are the perfect choices for landowners with extensive grounds to maintain, difficult terrain, and tough vegetation. Integrated deck wash ports are standard on every LS mower. • YTH22V43LS: Husqvarna’s Endurance V-Twin engine provides the oomph behind this riding mower. Manufactured by Briggs & Stratton, this engine is equipped with a premium air filtration system, chrome plated valves, and a cooling system that safeguards the engine from overheating for years of superior service. Cruise control and a 43-inch cutting deck complete the package. This LS entry-level tractor commands a price of $2,199.95. • YTH23V43LS: This model’s dash board has an hour meter with a service reminder feature. Its engine upgrade to a commercial-quality motor that has withstood 2,000 hours of performance in lab tests offers premium durability. Cast-iron cylinder sleeves and an automotive-type air filter system further extend the life of the engine. This model is priced at $2,499.95. • GTH26V48LS: This Husqvarna yard tractor offers ground-engaging 48-inch cutting capability in addition to all of the previous LS series goodies, making for a superior machine. The cost? A cool $2,899.95. • GTH27V52LS: At the top of the Husqvarna riding mower heap, this one cuts a 52″ swath through the competition. The first-class ergonomic design of this model makes it a machine fit for a king. All the levers and buttons are within a finger’s reach; the 15″ high seat back with armrests is fully adjustable to optimize his highness’ comfort level, and the steering wheel features comfort-grip padding to protect his manicure. At an MSRP of $2,999.95, Husqvarna’s lawn tractor flagship represents the ultimate in power and durability. Most consumers trust the Husqvarna brand to deliver quality and durability. The manufacturer’s attention to user comfort and convenience culls high marks among Husqvarna riding lawn mower owners, and they are willing to pay a bit more for a piece of equipment with the security of a trusted brand name. Some owners expressed the opinion that other brands out-perform the Husqvarna lawn tractor on hilly terrain, being better balanced for optimized slope-side mowing. Others have complained of engine problems in some of the lower end Husqvarna models and of the frustrations they have encountered in dealing directly with the manufacturer to resolve these issues. 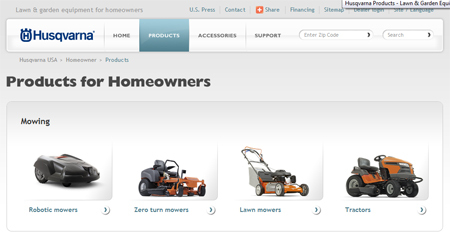 Multiple outlet giants such as Sears, Lowe’s Home Improvement Centers, and Home Depot sell Husqvarna riding lawn mowers. Husqvarna power products are also available at many smaller home and garden centers. Be sure to choose a retailer you trust to provide the warranty service and future repairs you may need when purchasing your riding lawn mower. I bought 2010 hus 25k54 in December. i m impress this tractor has power pushing and pulling. i live in the country i use it plow snow last big storm over foot snow, use 200 pound weights in the back work pretty good also i use tow big 5×8 trailer to hual cord fire wood even up the hill too! i test it with 2500 pound car to pull it up hill too. the only thing i don t like the reverse is to slow sometimes can t go backward with load. i solve the problem by cutting the plactic cover longer to make the lever shift go back more work much better and faster i did the same with forward too. good price too. I have a Husgvarna 42 inch cut and some how I bent the deck. What is the cost for a deck for this Riding Lawn Tractor? be sure the deck is bent. a common problem with these mowers is a piece of the deck becomes loose. if mower is less than a year old, they should fix it for free. they did mine! try ringing a huskvana dealer !!!! I need a manual for YTH22V46 in English. Might check with the company. Read on another thread there had been a recall on a Kohler engine on a riding lawn mower. Don’t remember which Husqvarna it was. Maybe do a web search. Does Husqvarna Riding Mowers have a warranty? I bent my deck on the 46″ model and it cost $400.00 to replace. The deck is now bent again and I’ve decided this mower is not what my property needs. The 22V42 Mower is perfect for my needs and the property we own and mow. My one and only complaint is that when I brought my Mower to the Dealer for Service, when I returned home with it, I noticed there was a small tear on the seat. When I asked them about it, they acted contrary and didn’t know if there was a Warranty and just let the phone line go unanswered… The Mower is too new for it to be normal wear – and – in 15 years of using tractor mowers – I’ve never has a seat to rip/tear ever. No one seems to care and I guess that’s how it is after you spend the big bucks on their product. When did Husqvara change their engines for their ride on mowers from kohler to Briggs and Stratton.I have had a 2006 Husqvarna and had lots of problems with the engine,so have now traded it in for a new one with a Briggs and Stratton engine,as I have had Cox ,and Rover mowers with Briggs and Stratton Engines,and have found them much more reliable. I purchased a SRD17530 lawn tractor in June 2012. It is the biggest mistake of my life. I am 100% dissatisfied with my purchase. I have had chain saws, leaf blowers from Husqvarna but this mower is my last purchase. I bought a brand new Husqvarna in May 2012 and could not be more unhappy with it. It would not even run – back to the dealer it went. Stayed there three weeks. Used it several times, then it quit mowing. Back to the dealer – it’s still there two months later. My advice ? Buy something else that runs and mows. i bought a 22 46 in march last week i heard a funny noise form under the seat when i checked it out the battery box had fallen apart and fell on the cooling fan so lowes told me to take it to a repair facility and they said 1 week well after a week well another week if this is the service they want to deal with i wont buy this brand again even tho lowes did end up having me pick it up and they replaced it for me thanks to lowes but boo for husqvarna i would not but another one on purpose very poor quality. I have a 24/54 riding mower. runs great, quite compaired to other mowers, but I have run into other problems. Firts, the reverse is so slow I sometimes can’t back up a hill when mowing. Second, and the most mading is I have to clean the deck just about every time I mow the lawn. No matter if the grass is totally dry or not, the deck always seems to clog and it starts to spit out large clumps of grass. YES, I mow almost 2.5 achers of grass, but the mower before this one I only had to clean the deck about twice a year. I purchased a YT24/48 to mow my 3/4 acre lawn. It is not hilly but has dips in it in a few spots. The engine is great, the power sufficient but, this deck keeps clogging up every 4-5 rows. It makes NO difference if the grass is dry or wet. Tall (3 in) or low (1 inch) it clogs up, throwing out large clumps, loading up and causing the belts to squeal and actually caused the engine to die once. I have to power wash it 3-4 times each time I mow. I am seriously doubting my decision to buy this. Nothing but problems from my yth2348 – steering is bad front wheels fall off – brass bushings in wheels not brgs – a joke ! The grease certs wont stay in wheels -they fall out. I having the exact same problem the front wheels wont stay inflated & the first day I had the YTK2246 I took a hard right in the field I was cutting & the tire came right off the rim ! I have only had this mower a short time but compared to my fathers Cub cadet well this mower is just like ridding a tin can . It is so light & top heavy & you can feel the frame twisting right under your seat . Had I known this I would have never have gotten this mower , also the seat wont stay in place . It is a misery for its price it is not worth the money. Purchased a MZ5424 zero turn from a Husqvarna dealer, it has broken 5 mower deck mandrels (the housing that the blade attaches to the deck) and NOW the dealer states the parts are on backorder. This is a poor design, it needs to be upgraded, Husqvarna does not seem to think this is a problem and they also have failed to get back to me. I would NOT recommend this mower to anyone. Tom that doesn’t solve the problem though. The mandrels themselves are made from cheap Chinese-made white metal. I break 3-4 every season I’m going out of my mind with it. does ANYONE know where to buy better parts for these things? i am in need of an owners manual for a husqvarna YTH2046B (in English) with the 20 hp engine and 46 inch deck. I have a Huskvarna YTH24V48LS I bought it because I have a step hill this riding lawn tractor it’s super in hill and on wet grass. The only problem is turning, the front weels has a tendency to slip sideways and does not turn properly the turning radius is very long. I recently purchased a Husqvarna model number yth22v46 mower from lowes home center and I am already needing parts for this new mower .and I find the parts are no longer available the part I need is 32 532 19 74 73 pulley mandrel .And every where I look I get the same ansure. What is the best procedure to remove blades for sharpening. Does the deck come off easy. I had a YTA19K42. It lasted about 35 hours (two summers )before developing transmission problems. It was used to cut about one acre of flat yard during the spring and summer. No hills or challenging terrain. The local repair shop, which sees all makes an models, could not determine why it was malfunctioning and finally suggested I contact Husqvarna. I have never encountered worse customer service than that offered by Husqvarna. When they aren’t ignoring you, they are quoting the warranty to you. When your mower isn’t working right at 35-40 hours of use and it is unrepairable, it’s time for the manufacturer to come up with a solution. Husqvarna is not that manufacturer. Lowe’s, where I purchased it, replaced it with a newer better model no questions asked and despite the fact that the warranty was up. Now I have my fingers crossed that the new Husqvarna lasts longer than the old one because I hold out no hope that Husqvarna is going to get better at customer service. HAVE 48 INCH , GOT THIS SPRING 2014, BIGGEST PIECE OF JUNK I’VE EVER BOUGHT. HAVE A SLIGHT INCLINE IN MY YARD AND REVERSE IS USLESS HARDLY MOVES. SO FRUSTRATED I,M SELLING. I purchased a Husqvarna brand GTH26V48LS. I’ve had it about 4 yrs and this is the second steering component I having to put on th first was coverd by warranty but this was only after first mowing season. Now 2 yrs later and I find myself springing for another one. However, the parts distributor are unable to produce part, been on backorder for a month. It’s absolutely amazing that everyone is aware when mowing season is coming and there are no parts to be had. The power of the lawnmower is good although it has troulbe backing up a slight grade which is annoying but I make do. I thought that Husqvarna was the way to go, but I’m been wrong before. I called Husqvarna and I was told that it wasn’t there problem its the parts distributors. The place where I pruchased the lawnmower has been trying to get there hands on the parts but has had no luck. they were able to give me an approximate date at one time but that has passed, in fact 2 wks. i’ve spoke with other Husqvarna owners that I know and it is the same across the board, early breakdowns and parts availablity is sparce at best. We purchased a Husqvarna riding mower. The cruse control didn’t work, My husband left that go. Three months after we purchased the mower my husband found apiece of a steel rod laying on the lawn. Our son stopped by the next day and told us it looks like a post of some kind. He looked under the mower and told us it was a part of the tractor. We called the company were we purchased from and they sent it out to be fixed. Two and a half weeks later we got it back with a $188.00 bill stating it wasn’t a defect. it was physically broken off. My husband can’t get on the ground to look under the mower because he is missing a leg. When I called Husqvarna they said they were going by the repair shops remarks. I asked for the part to be returned and was told to contact repair shop. I called them, still waiting. I purchased a LGT2654 in May, 2013. Like the lawn mower except for 1 issue.. The bushings in the front wheels wore out after 1 season, even thought they we greased several times during the season. Wore so bad I also had to replace hubs, under warranty . Now, after this cutting season bushings are again wore to the point they need replacing. They were greased heavily. The axle itself is not wore at all. Now, even though the mower is still under warranty, the company wants me to pay the labor top replace the bushings. Worse yet, the warranty will expire next spring and since they have no other option than to replace the worn bushing, I will have the same problem at the end of next cutting season. They tried to use the excuse I have a rough lawn, which is total BS. I built my house in 1975 and have been cutting lawn here for 40 years with many different brands of lawn mower and never had a front wheel bushing issue. Then they tell the authorized repair shop that I have to keep greasing the bushings heavily. It will only hold so much grease. I truly believe they have a problem with the bushings, but they won’t lwt me talk to anyopne that can truly do anything about it. I bought a LGT 2654 Garden Tractor with a 26 HP V-Twin Kohler Courage engine in it we bought it from Lowes in East Peoria. I bought it back in July 2013 and now the warranty has ran out and come to find out the shaft welds it self to the baring. The cost to replace the engine is approx. $800.00 and the time to put it back in. and yes it just did it to me… I will NEVER Buy a Kohler Engine again. McCULLOCH M95-66X -Tractor full waste. Customer service: zero tolerancy. Correction: under criticism. I do not recommend it to anyone!